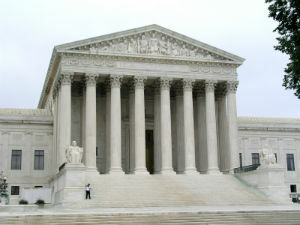 Heffernan v. City of Patterson: By a vote of 6-2, the Court held that when an employer demotes an employee out of a desire to prevent the worker from engaging in protected political activity, the employee is entitled to challenge that unlawful action under the First Amendment and 42 U.S.C. § 1983, even if the employer’s actions are based on a factual mistake about the employee’s behavior. The plaintiff in the case is a former police officer in Paterson, New Jersey. Evenwel v. Abbott: The Supreme Court clarified the Constitutional principle of “one person, one vote,” which requires jurisdictions to design legislative districts with equal populations. In the key redistricting decision, the justices unanimously held that a state or local government may draw its legislative districts based on total population. “As constitutional history, precedent, and practice demonstrate, a State or locality may draw its legislative districts based on total population,” Justice Ruth Bader Ginsburg wrote. Army Corps of Engineers v Hawkes Co.: The unanimous Court held that a “jurisdictional determination” (JD) that wetlands are subject to regulation under the Clean Water Act was a final agency action within the meaning of the Administrative Procedure Act. The key environmental law ruling left intact the test established under Bennett v. Spear, 520 U. S. 154 (1997) for determining whether an agency action is “final” under the APA. Commonwealth of Puerto Rico v Franklin California Tax-Free Trust: The Court held that Section 903(1) of the Bankruptcy Code pre-empts Puerto Rico’s Recovery Act, which would have allowed public utilities in the commonwealth to restructure $20 billion in debt. In reaching its decision, the majority concluded that Puerto Rico is considered a state with respect to the federal bankruptcy code’s pre-emption provision, which expressly bars states from enacting their own municipal bankruptcy laws. For additional information regarding the above cases, please visit the Scarinci Hollenbeck Constitutional Law Reporter by clicking here. To discuss the legal issues involved, we encourage you to contact a member of Scarinci Hollenbeck’s Government Law Group.